Low grade appendiceal mucinous neoplasms are a challenging entity not just due to their innocent appearance and aggressive extension but also due to their origin dilemmas. 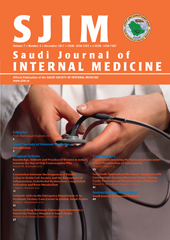 We present one such interesting case in a 35-year-old Saudi female who presented to King Abdulaziz University Hospital with acute abdominal pain. Th e patient presented with the main bulk of the mucinous tumor in the left ovary with extensive pseudomyxoma peritonei. Incidentally there was also a mature cystic teratoma in the same ovary. Appendiceal origin was confi rmed on histology and immunohistochemistry. In conclusion our case scenario of low grade appendiceal mucinous neoplasms with concomitant ovarian mucinous tumor, mature cystic teratoma and pseudomyxoma peritonei suggests appendiceal origin both on morphology and immunohistochemistry. As such routine excision of appendix in these case scenarios remains a valid consideration.